As healthcare costs rise, so too do the costs of assessment instruments, critical tools for mental health professionals. While some traditional assessment instruments have become prohibitively expensive, as with many other fields, the Internet offers a host of more affordable and equitable alternative assessment tools at little or no cost. The pitfall of this alternative, thus far, has been the lack of vetting and quality assessment. 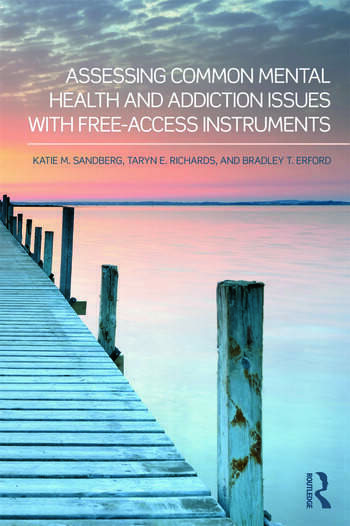 Assessing Common Mental Health and Addiction Issues With Free-Access Instruments fills this gap by providing the first analysis and assessment of these tools, provided by some of the leading names in mental health assessment instruments. This resource identifies the most efficient free access instruments and provides summary information about administration, scoring, interpretation, psychometric integrity, and strengths and weaknesses. The book is organized around the most common broad range issues encountered by helping professionals, and whenever possible, a link to the instrument itself is provided. This is an essential text for all mental health professionals looking to expand the scope and range of their assessment instruments. Katie M. Sandberg, MA, is a national certified counselor, mobile mental health counselor, and a member of both Psi Chi, the International Honor Society in Psychology, and Chi Sigma Iota, the International Honor Society in Counseling. She has authored numerous textbook chapters, supplemental instructional materials, and a professional journal article currently undergoing publication in the fields of lifespan, and human development and assessment. Taryn E. Richards, MEd, is a national certified counselor and a professional secondary school counselor in Maryland. She has authored textbook chapters, supplemental instructional materials, and a professional journal article currently undergoing publication in the fields of lifespan, and human development, treatment, and assessment. Bradley T. Erford, PhD, is the 2012-2013 President of the American Counseling Association (ACA) and a professor in the school counseling program of the education specialties department in the School of Education at Loyola University, Maryland. He has authored or edited more than 15 books. He has received numerous awards for his scholarship and service to the counseling profession from ACA and the Association for Assessment in Counseling and Education (AACE).